This weekend daylight savings time ends and we fall back. We all love that initial daylight savings time extra hour and that extra hour of sleep! What if we keep appreciating that extra hour as a daily bonus? 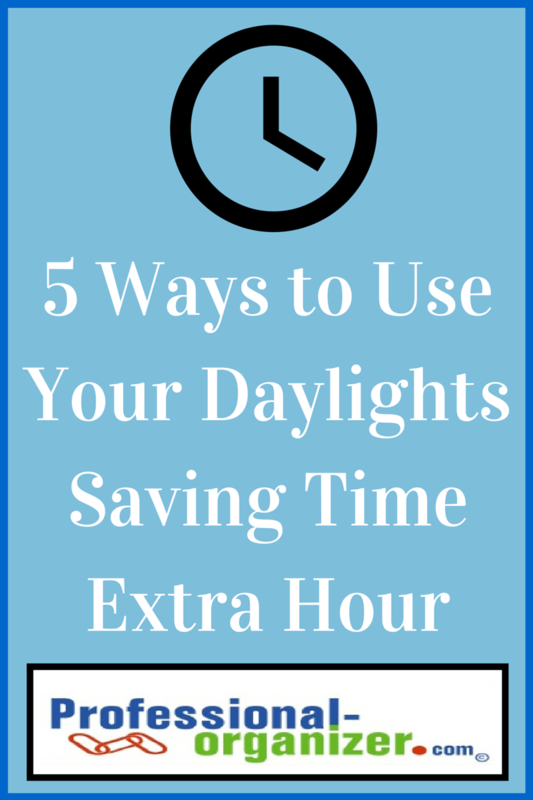 Here are 5 ways we can use that extra hour for our priorities. We never feel like we have time to exercise! Think about adding one hour of walking, cardio or other exercise to you day. You can break this into 2 segments, morning and evening too. How many magazines and books are accumulating in your home? Take one hour for your reading pleasure. Life is busy and we seldom have time for a meal together. Family meals promote communication and cohesiveness. Keep heading to bed early so you can rise and shine with an extra hour of sleep each night. Use your extra hour for planning time. Whether it is your weekly planning or family meeting, adding in planning time makes your life less stressful and more meaningful. Join me on my pinterest board, Time is on My Side! Learn loads of time management ideas. It’s already the holiday season! We see it in our yards with Halloween decorations, in shops with Christmas decorations, and we feel it in the energy around us. Thanks to BlogElevated, I have asked some bloggers to share how they get organized for the holidays. How do you get organized for the holidays? Admittedly, I am not the most organized person, however when it comes to holiday decorations I make an exception. We store all of our holiday decor in labeled containers in the garage and pull them out when it’s time to decorate. I always make sure the house has had a good cleaning/dusting before setting out our decorations. Then, when the holiday is over all of the decorations go right back into their container! Inevitably, we end up with a bit more decor every year and have to buy another container, but it’s worth it to keep things organized! I start planning at least a month in advance. Decorating is always my first priority, because it takes so much effort, and I can enjoy it the longest. I think of things that enchanted me as a child, and then try to incorporate them into my lifestyle with my family now. Next, I start dreaming up recipes to share with my family and friends. Sweet treats and Main Dishes, always including traditional favorites as well as new tastes and flavors to help begin new memories. When it comes time for preparing for the holidays, meal planning may come to mind when you’re planning that celebration meal. But with the busy holiday season, healthy habits can take a back seat to more fast and convenience foods that are not so good for you. But it doesn’t have to. In early November, I like to make up several healthy meals that to store in my freezer. Adding a simple salad or steamed vegetable to most meals means you’ll not only be eating a little healthier but also saving money to spend on holiday shopping and activities. My holiday organizing is about breaking things into baby steps. I love my holiday time line for getting it all done! 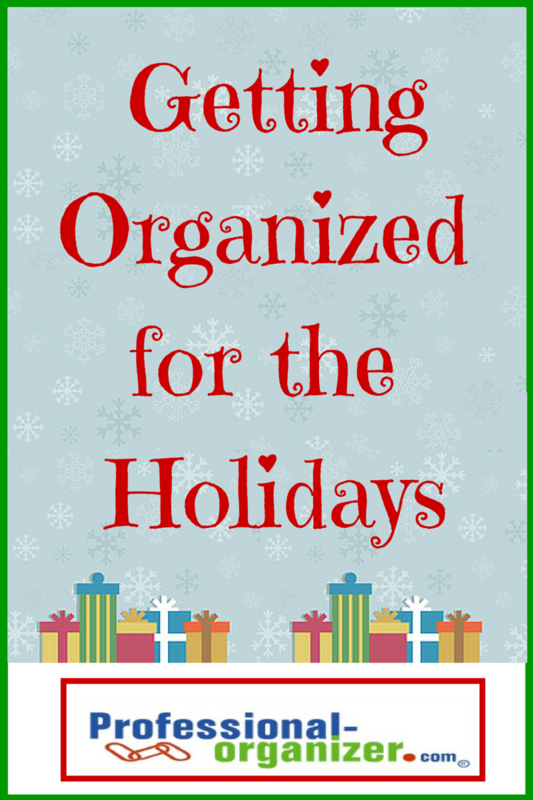 How you you get organized for the holidays? Company’s coming! What a great way to make sure you are organized! These words strike fear and get you in gear. It’s time to tackle the guest room and the dining room. 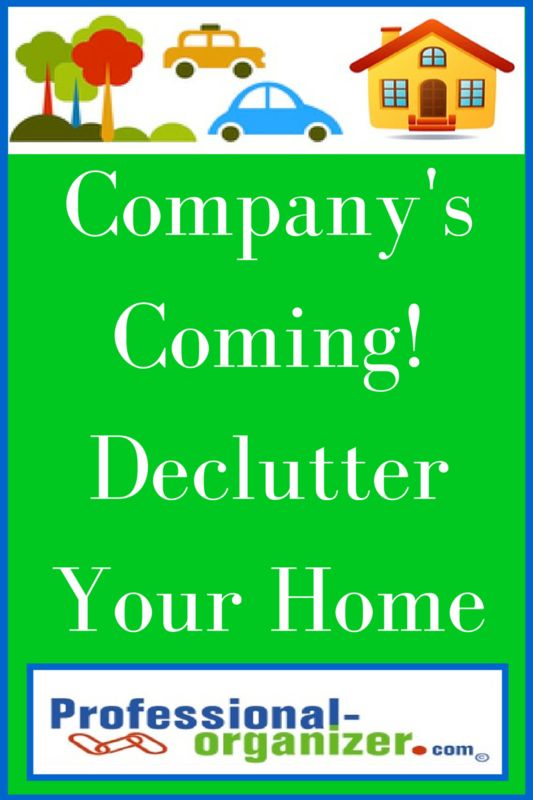 Decluttering your home before company comes creates an inviting and welcoming space for them. Follow these 5 easy steps to declutter and be ready for visitors. Guest rooms become storage. Dining rooms become work areas. Both are easy spots throughout the year just to drop off bags from the car or other purchases you have not found a home for yet. Set aside time on your calendar in 2 hour segments for decluttering. You can get these areas back to their original use easily and efficiently. Reset and distribute. Start by grouping items and then distributing to appropriate spots in your home. Your kids can help by being runners. You can use a basket or plastic tote to help carry items to where they belong. Organize room by room. Next go room by room and incorporate those items. This will require some editing and blending of new and already owned items. Get ready to cast off and donate what you have replaced with newer items. Create mobile storage. If your dining room was used as a craft room, think about storing crafts in 3 drawer sterilite rolling cart. These can be rolled to the garage for storage while your room is being used for holiday dinners. Power through paper clutter. If paper was stashed in your guest room, consolidate it into bags. Use 15 minute time pockets to power through what you are keeping and what you are discarding. Once you have culled this down, set up 15 minute periods to file. Powering through paper helps you know what to keep and what to discard. Fun and function. Set your table for your holiday dinner early. It will keep your table from getting cluttered again. Freshen up. Freshen up your guest room with new linens, a small tray of toiletries and mints, and fresh flowers to keep your room ready for guests. Fall organizing prepares you for the fun ahead including holidays. Lots of gifts, for family, friends, and charity, will be wrapped in the next few months. There is seldom a home that is not overflowing with materials to beautify a box or bag. 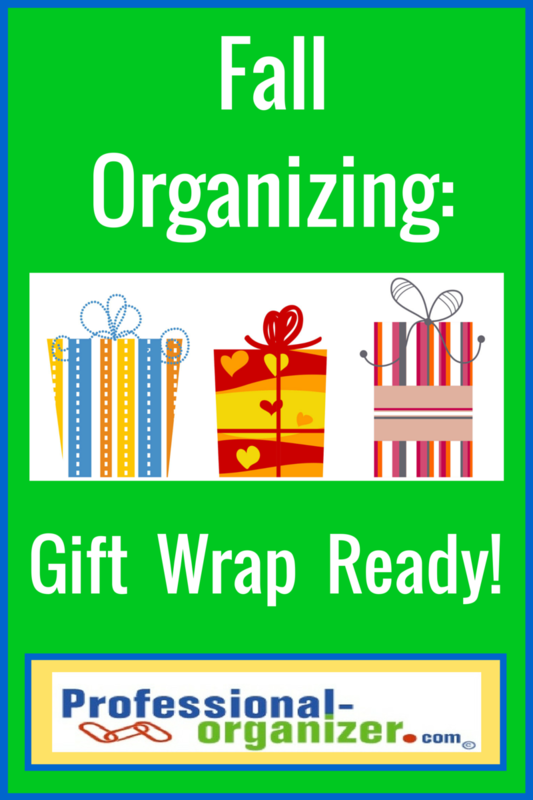 Be gift wrap read by organizing and sprucing up your stuff. Organize your gift wrap and be ready for the holiday season. Start by culling out what has seen better days. It’s easy to think you will need an abundance of bags, tissue and ribbon. However, be sure these are in excellent condition to use for another gift. Decide how many bags of different types are needed. If you have too many baby shower bags or happy birthday bags, decide on a number to keep. Your bags and wrap can be recycled or donated. Decide what other supplies you need. Fall is often when school fundraisers for gift wrap take place. Knowing what you need will help you support local charities and not over purchase. Your gift wrap station should be easy to access. There are lots of possibilities. Hanging gift wrap bags are popular to store bags in guest closets. Dresser drawers in your guest room are an option. Short, three drawer sterilite plastic chests can work too. Having subdivided areas for tissue, ribbon, bags and rolls makes it easy to find and use your supplies. Under bed gift wrap organizers are available for any room. You can also divide holiday and every day supplies, storing holiday with your holiday decorations. Place the items in your new storage area. Label the categories so you know what is stored in each space. Take a little extra time each time you wrap a gift to replace items where they belong. Maybe this year you want to forgo gifts and go clutter free too! What’s your gift wrap trick for eliminating and storing? Don’t miss a minute of upcoming organizing tips and techniques! Click here to subscribe to my monthly newsletter. Fall organizing makes ready the transition to autumn. I love Fall! It’s a time of transitions, back to school, fresh starts, and the gateway to the holidays! Here are five fall organizing tips for your home. Focusing on these areas will make your home company ready too! Activities gear up during the fall. Your kids activities, church activities, fall festivals, and football games are all important dates and time to add to your calendar. You may be planning to travel as well. Add all your dates to your calendar as soon as possible. You will avoid conflicting activities and feel more in control. Set aside time to prepare for big events. Be sure you add in preparation time. This includes time to make food, time to pick up an item or time to travel to your activity. Get your family into the swing of things with a family meeting, recording dates on a month at a glance calendar posted in your kitchen. Use checklists. Spend a few minutes the week before an activity writing down all the items you will need to bring. Having a checklist makes it easy to be sure everything gets to your destination. Happily we need light sweaters and jackets, different shoes, and hopefully an umbrella during fall. Create a spot where things come and go in your home right at your entry. A basket for shoes or boots corrals them where you can find them later. Hooks on the wall add a spot to leave a jacket. A small attractive trash can can hold umbrellas. Use baskets or totes to carry items back and forth to the car. A tote gives you a spot to place a return or other item that needs to get to the car. It also is a way to carry it there. Storage for keys. Attach a key spot for dropping your keys as soon as you enter your home. As with all spots in your home, remember to declutter regularly. Too many shoes or jackets at your landing strip makes chaotic clutter. Start by dividing items by craft. If you know you are no longer doing that craft, send the supplies off to Texas Art Asylum. Divide your space by “centers” where you can use your craft supplies, setting up spaces with a table, chair and storage for your supplies. Plan a projects area to store multiple projects in progress. Often you are working on several projects simultaneously. Take this into account in our craft space. Many of our holidays revolve around food. In the fall we are entertaining more and inviting in company. Dinner time is back in full swing with the routines of school and work. Organizing your pantry makes it easy to prepare meals. Remove everything from your pantry and toss what is expired. A turn table lazy susan is great for difficult to access corners. Canisters for flour, sugars, and pastas are important in our climate. Cooler temperatures will start soon. It’s time to rein in the outside clutter too. Bring pool items, cushions and extra toys in and store in your garage or attic. Remember to hose down items and clean before storing. Add vertical storage to the garage to store tubs. Label your tubs for easy access. Freshen up your entry by sweeping, dusting and cleaning your door and entry way. 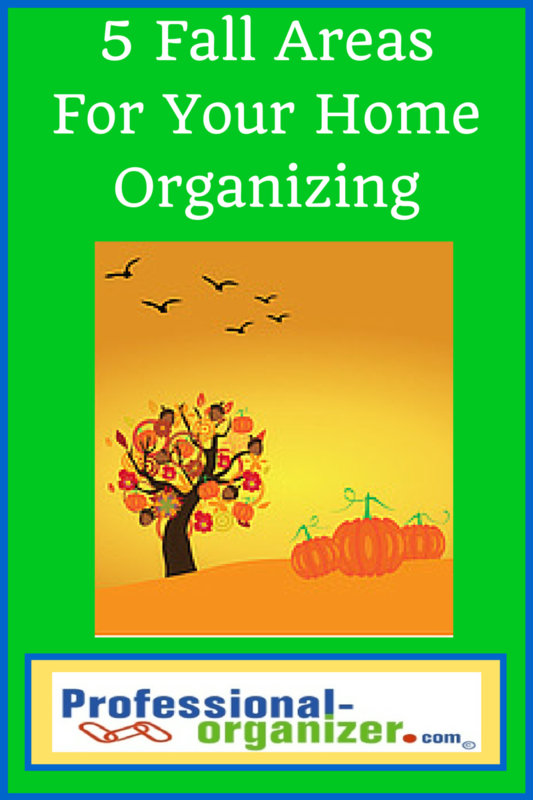 Fall organizing prepares you for upcoming events. Have these areas decluttered and ready for fun! Don’t miss a minute of upcoming organizing tips and techniques! Click here to subscribe to my monthly newsletter.